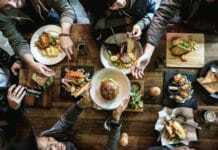 Americans love to eat out — so much so that there are 640,000 total private food service and drinking establishments in the United States, according to the Bureau of Labor Statistics (BLS). That includes everything from local bars and fast-food restaurants to moderately priced chains and expensive steakhouses. Citing Census Bureau numbers, USA Today reports that there are 78 full-service restaurants for every 100,000 people in America. That might not sound like a lot, but it only includes full-service, sit-down restaurants with a wait staff; it doesn’t include fast-food joints. Also, the 78-to-100,000 ratio looks tiny when considering how many restaurants are in upscale vacation communities. Breckenridge, Colorado has 410 full-service restaurants for every 100,000 people, Key West has 284, and Ocean City, New Jersey has 331. No matter how you cut it, that’s a lot of restaurants. In most places in America, all you have to do is take a short drive to find any number of burger, pizza, and sandwich shops waiting and willing to fill your food cravings. Choice is always good, but too much choice isn’t, especially when it comes to something that’s bad for you. The incredible number of dining options has contributed to Americans’ skyrocketing obesity rates and rising debt. So, why are we eating out so much? 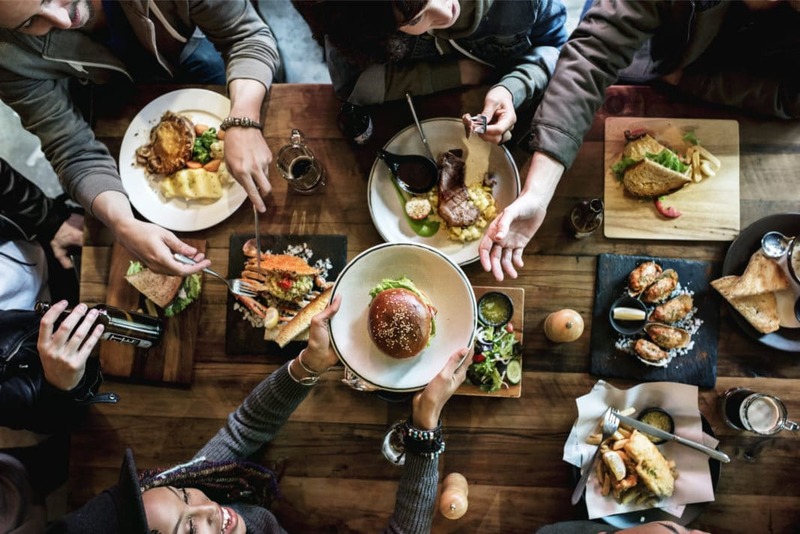 Here’s a closer look at the phenomenon, what it means to you, and how you can save money by cutting back on restaurant expenditures. Restaurants fall into different segments based on certain criteria. Here’s a look at what each term means. A fast-food restaurant, also known as a quick-service restaurant, doesn’t offer table service. You go up to a counter, place your order, and get your food on a tray. These restaurants offer a limited number of items — such as hamburgers, deli sandwiches, or hot dogs — depending on their specialty. You can expect foods cooked in bulk that will come to you fast. When going through a drive-thru, a staple of fast-food restaurants, you can expect to receive your food in three minutes on average. A typical fast-food meal costs less than $6. Examples of fast-food restaurants include McDonald’s, Chick-fil-A, and A&W. A fast-casual restaurant is a step up from fast food but a step below casual dining. Fast-casual has limited to no table service, uses fewer processed foods, and has a more inviting, sit-down feel. Customers spend an average of $12 per person at fast-casual restaurants, such as Chipotle, Panera, and Five Guys. Casual restaurants have sit-down service, a wait staff, printed menus, and serve a wide range of moderately priced foods, including appetizers, salads, main courses, and desserts. The average casual restaurant check was $13.75 per person in 2013, which doesn’t include tax and tip. Examples of casual restaurants include Bob Evans, Applebee’s, and The Cheesecake Factory. Fine dining restaurants offer the best food, experience, and amenities on this list. They feature a full-service bar, wine list, and a more intimate atmosphere. Some of these establishments might have white tablecloths covering the tables. Fine dining prices differ dramatically, but Business Insider reports that you can expect to spend an average of $71 per person at The Capital Grille, $69 per person at Fleming’s, and $88 per person at Eddie V’s. Again, that doesn’t include tax and tip. I learned to cook from my grandmother when I was 8 years old. My grandfather, who had a third-grade education, was a meat cutter in New Jersey. Each morning, he rose early and traveled from their Bronx apartment over the George Washington Bridge and into work. Those hard days at work kept him hungry, so my grandmother taught me how to make his favorite foods: biscuits and gravy from scratch for breakfast; collard greens, chicken or meatloaf, and mashed potatoes for dinner. She taught me every nuance of cooking, from gently handling dough so it wasn’t tough to peeling potatoes so I wouldn’t cut my fingers. Similar lessons are still going on in kitchens across America, but not nearly as often. Despite all of those cooking shows on TV and free recipes online, Americans as a whole now spend more money in restaurants than in grocery stores. Here’s why many of us no longer cook at home. Some 45% of Americans say they hate to cook, while another 45% say they could live without it, according to the Harvard Business Review. Just 10% of Americans say they love to cook, and that number has dropped by a third over the last 15 years. 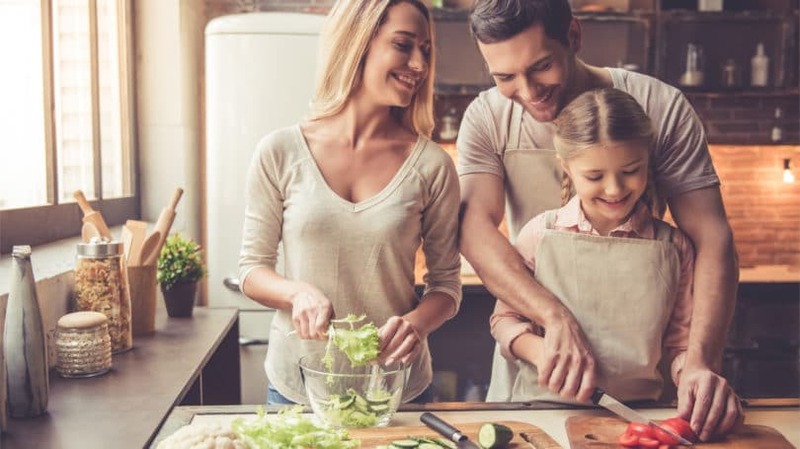 A story published in Nutrition Journal found that between 88% and 95% of Americans prepared their meals at home in 1965. That number dropped to between 65% and 72% by 2007. What’s behind this lack of love? Read on. Times are different. In 1960, both parents worked in only 25% of American families, according to the Pew Research Center. Today, that number is 60%. When both parents work, it’s harder to find the time to cook at home, especially when you’re shuttling kids to after-school activities and sports. Americans are also working longer hours. The average full-time American worker puts in 8.56 hours per day, or just under 43 hours per week, according to the BLS. White-collar workers put in longer hours. 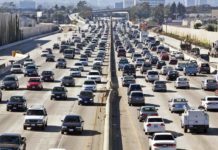 In addition, the average commute to and from work adds more than four more hours a week to workers’ schedules, and that’s just on average. In Nevada, it takes almost two hours each day for most workers to get back and forth from work using public transportation. Those who drive in Washington D.C. have an average commute of about 44 minutes each way. The Nutrition Journal speculates that people aren’t prepared to cook and lack the skills, confidence, and knowledge to prepare meals at home. It notes that home economic courses, once a staple of education, have all but disappeared. Without those courses, there’s little opportunity to learn cooking fundamentals at a young age. It’s also possible that all of the TV cooking shows and online recipes out there are giving us a cooking complex, Epicurious notes. The pictures and videos look tasty and terrific, and the ingredient lists are intimidating. Some 10-year-old on Food TV’s “Chopped Junior” just made an entire meal using squid, licorice, spam, and some other food I can’t even identify. It’s hard not to want to order out after watching something like that. Everyone gets a craving now and then. I crave pizza — a lot. I love hamburgers. And beef hotdogs with chili? Lord save me. Cravings themselves aren’t bad, but regularly fulfilling those cravings is awful for you. The same goes for eating out. About one in five Americans visit a fast-food restaurant at least once a week, and more than seven in 10 Americans eat lunch at a fast-food restaurant. All told, Americans are eating meals out, on average, five times a week. And that convenience comes with some serious costs. 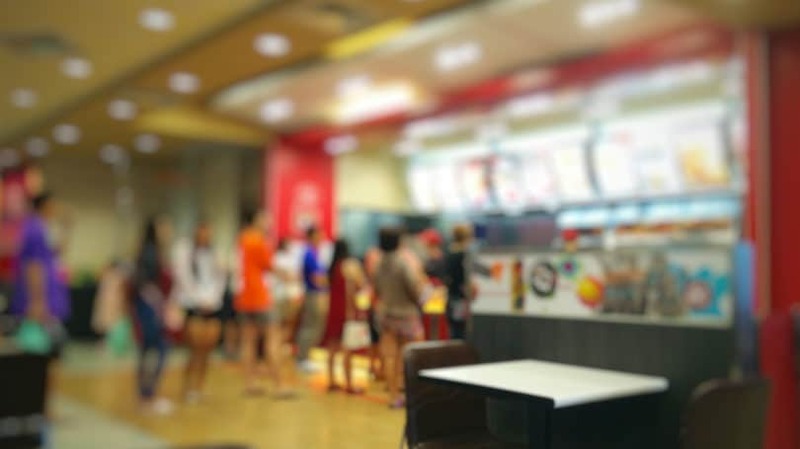 The USDA’s Center for Nutrition Policy and Promotion reviewed research examining the correlation between eating out — especially at fast-food restaurants — and weight gain. It found that fast-food intake directly correlates to weight gain in children, even if they only eat out once a week. In adults, one study showed that eating fast food more than once a week resulted in increased BMI. BMI, or body mass index, measures whether you’re underweight, overweight, or within medically acceptable weight parameters. Other studies also show a correlation between eating out and weight gain. These findings are especially concerning against the backdrop of America’s continued obesity epidemic. About 90 million U.S. adults, or roughly 40% or the population, are obese, according to the Centers for Disease Control and Prevention. Any adult with a BMI between 25 and 30 is overweight, and more than 30 is considered obese. Nearly 14 million children between the ages of 2 and 19, or 18.5% of the population, are obese. Obesity leads to heart disease, which leads to about 800,000 deaths each year in the United States. Obesity also leads to high blood pressure, which can cause strokes. Some 75 million Americans suffer from high blood pressure, and nearly 800,000 people each year have a stroke, which is the fifth-leading cause of death. Other obesity-related health issues include sleep apnea, diabetes, gout, gallbladder disease, and gallstones. Being obese also costs a lot of money. Those with obesity spend more money on health care than those who are not obese — an average of $1,429 more per person per year. There’s also the sheer cost of eating out itself. The average U.S. household spends $3,000 per year eating out, according to BLS statistics reported by Business Insider. The numbers fluctuate significantly by age group, however. Generation X, or those between the ages of 35 and 44, spend $4,249 per household per year. Those in the 45-to-54 age bracket spend slightly less, at $4,157. 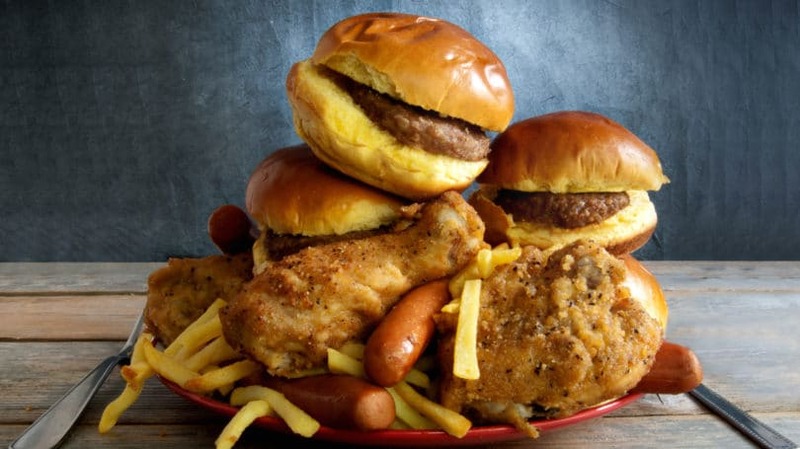 Most of the medical studies connecting eating out with weight gain look at fast food. But fast food isn’t the only culprit. Mid-priced and fine dining restaurants can also help you add pounds. Here’s why. How restaurants prepare foods has a significant impact on how healthy those foods are. Fried foods add calories, as do the heavy creams and sauces dousing certain foods. Even vegetables can be made unhealthy by adding butter and salt; sure, it tastes good, but there goes all the nutritional value. The same goes for fish; a nice piece of salmon with lemon becomes calorie hell if you add hollandaise to it. The USDA recommends an average adult male should consume 2,500 calories per day, and the average adult female should consume 2,000. In 1970, the average American took in 2,160 calories per day. By 2010, we were ingesting an average of 2,673 calories daily. It’s no surprise that since the 1970s, childhood obesity rates in the United States have tripled. The sheer size of our meals has also changed dramatically over the last 20 years. Some of this has to do with plate size. Plates and portions today are enormous by historical standards. In the 1960s, the average plate size was 7 to 9 inches in diameter. Today, dinner plates are 11 to 12 inches in diameter. The larger the plate, the more you can put on it. Bagels are more than twice as large, increasing from 3 inches in diameter and 140 calories to 6 inches in diameter and 350 calories. That doesn’t include butter or cream cheese. Cheeseburgers have increased from 333 to 590 calories, on average. Of course, if you’re going to have a cheeseburger, you’ll likely also have fries and a drink, which adds even more calories. Spaghetti portions are on the rise. One cup of spaghetti and three small meatballs is 500 calories. But a portion you’re more likely to see today, two cups of spaghetti and three large meatballs, contains 1,025 calories. French fry servings are bigger too. A 2.4-ounce portion contains 210 calories. Today’s 6.9-ounce portion has 610 calories. Again, this isn’t limited to fast foods. There are plenty of meals at sit-down restaurants that break the calorie bank in one sitting. Texas Roadhouse has a 16-ounce prime rib meal that’s 1,570 calories without sides. Add a Caesar salad and a baked sweet potato loaded with marshmallows and caramel sauce, and you’re at 2,820 calories. The Dickie’s Barbecue Pit three-meat plate has a mouth-watering combo of beef brisket, polish sausage, and pork ribs with two sides. Add some ice cream for dessert, and you’re at 2,500 calories. The Cheesecake Factory has an amazing Pasta Napoletana chock full of bacon, pepperoni, Italian sausage, and meatballs. It’s 2,310 calories. Even at fine dining establishments, the calories add up. Steakhouses offer sauces, such as hollandaise, that add hundreds of calories to a meal. A steak without any sides clocks in at over 1,000 calories unless you order the smallest fillet on the menu. By the time you add sides, you’ve blown your daily calorie count in one meal. How Much Can You Save by Eating at Home? It costs five times as much to have a restaurant meal delivered to your home, and three times as much to prepare a meal from a meal kit, as it does to prepare a meal from scratch. For example, it costs about $22 for one order of chicken teriyaki from a restaurant, but the same meal costs $1.30 per serving to make at home. You could enjoy an order of chicken wings for $20 from a restaurant or at home for just over $2. A fancy beef Wellington costs only $4.53 per serving at home but more than $36 from a restaurant. Of course, from time to time, you will still want to eat out. Maybe you want to celebrate a promotion with a nice meal. Maybe it’s been a particularly tough week at work and you need to unwind. Eating out on occasion won’t break the budget. But if you cut back significantly on the number of meals you eat out, you can save a bunch of money in the process. Let’s say you cut your eating-out budget by $1,000 per year, or about $80 per month. You invest that $1,000 per year for 10 years in an index fund. Let’s say that fund returns 7.743%, the average the Dow has returned over the last 20 years. If you make this investment for 10 years, your pre-tax investment will grow to more than $17,200. Do it for 20 years, and you’re at almost $49,000. Or, let’s say you pay down debt with that $1,000. The average American has $6,375 in credit card debt. If you incur the average interest rate of 16.71% and pay the minimum balance of 2% a month, it would take you 86 months, or just over six years, to pay off that debt, according to Credit Karma’s debt repayment calculator. But if you apply that extra $80 per month to your bill, your payback period will decrease to 41 months, and you’ll save $2,655 in interest. You’ll save even more if you’ve recently accepted a new credit card offer. The average interest rate for new credit card offers is 19.05%. Using the same numbers as above, it will take 100 months, or more than eight years, to pay your bill if you only make the minimum payment. If you apply that extra $80 a month, however, you’ll pay off your loan in just 43 months and save $3,886 in interest. Imagine how much you could save, invest, or pay down if you cut your eating out expenses even more? Saving money and losing weight sounds great, but how can you make cooking at home realistic for your household? Try these tips. You can buy kitchen tools that will make it easier to cook at home. Slow cookers, or Crock-Pots, are easy to operate; simply put ingredients in them and let it cook all day. There is a multitude of free slow cooker recipes online, and slow cookers are inexpensive. 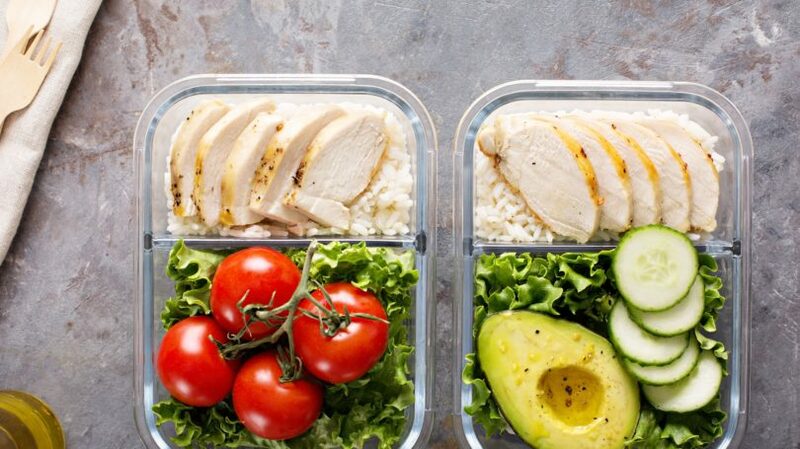 You don’t have to spend a ton of time to make a healthy, delicious meal. There are lots of tasty 30-minute meal recipes that are easy to make and take the pressure off cooking. You can save money, reduce food waste, and eat healthier with meal planning. It’s easier than it sounds, and it can save you time and the stress of wondering to make each night for dinner. Using a service like eMeals.com can make it extremely simple. Making food and freezing it also provides less-expensive, healthier alternatives to grabbing food on the go. You can work ahead so that when you come home, all you have do is pop your meal in the microwave or heat it up in the oven or on the stove top. There are plenty of easy freezer meal recipes to choose from. It’s not realistic to think that people won’t ever eat out. Between birthdays, Valentine’s Day, graduations, and other occasions, there’s always a reason to eat out from time to time. And there’s nothing wrong with that. The key is figuring out a balance between eating out and eating out too much. Eating at home will help your diet and your weight. You’ll know what you’re putting in your body, and you can avoid fat, sodium, and other byproducts that aren’t the best for you. You can use the money you save by cooking at home to pay down debt or add to your retirement savings. Plus, cooking is great family time, especially in an era when we’re working longer hours with longer commutes. You’ll build a lifetime of memories with your family, just as I have with my grandmother. And, when you become debt free, you can celebrate with a nice meal.